For the best part of 30 years, pioneer Singapore artist Lim Cheng Hoe spent most of his week as a clerk in the Public Works Department, now the Public Utilities Board. 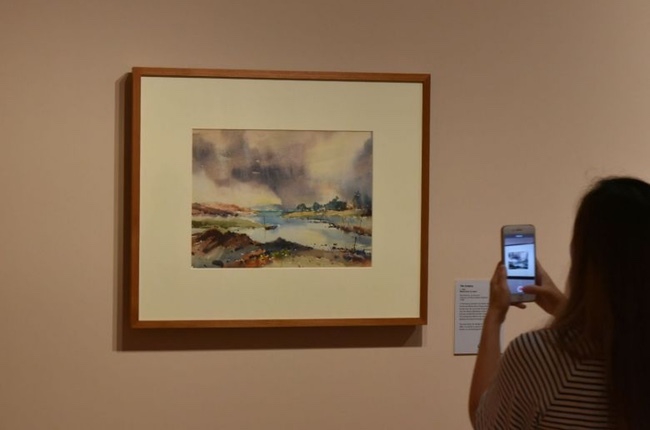 But on Sundays, he took to the outdoors with paints and brushes in hand to capture the scenes he loved - the many faces of the Singapore River and the kampungs of Pasir Panjang, Loyang and Bedok. Lim, considered the leading watercolourist of his generation, is having a homecoming of sorts at the National Gallery Singapore, which comprises two national monuments, the former Supreme Court and City Hall, where he had worked. More than 60 of his works as well as excerpts from some of his diaries will go on show at the gallery from Thursday to June next year. It is the first major retrospective of his work in 30 years. Lim was born in Xiamen, China, in 1912 and came to Singapore with his family when he was seven years old. Unlike most of his artistic peers, he did not speak Mandarin, only English and Hokkien, had a day job that was not in the arts and was largely self-taught, aside from a stint learning from Art Superintendent of Singapore Schools Richard Walker while he was at Raffles Institution. Still, Lim went on to be a leading figure in the practice of plein-air (outdoors) painting - no mean feat in humid, tropical Singapore, especially in the finicky medium of watercolour. Colours tend to blend in unpredictable ways, the paint dries quickly and mistakes are difficult to correct. Lim, who was one of the founding members of the Singapore Watercolour Society, gathered on the banks of the Singapore River on Sundays with his artist friends, who included Ong Chye Cho, Gog Sing Hooi and T.Y. Choy. Later, they travelled to kampungs or other scenic spots around Singapore. He became a fixture on the riverfront, with tourists gathering to gawk as he painted. Many of the scenes he captured have since vanished. In a 1970 diary entry, he wrote with dismay about the rapidly changing landscape. The attap huts in Bedok that he liked to paint were being replaced with aluminium-roofed square houses, which, to him, presented "an entirely different picture". In later works, he turned from scenes of bygone idyll to halffinished edifices and looming cranes of construction sites. He married Madam Low Chew Sim in 1942 and they had five children. He died in 1979 at the age of 67 from stomach cancer. Exhibition co-curator Lim Qinyi, 36, says: "He occupies an interesting position outside the dominant narrative of the Nanyang artists - he was an English-educated Chinese man and he chose watercolour despite its limitations. "He was always experimenting. Whether watercolour or gouache, he was versatile in the different languages of painting." Lim painted the stormy sky above this grey landscape wet on wet, allowing the colours to mingle on soaked paper. His interest in capturing the mood of the scene, rather than just the details, shows in the tension of the rain clouds and the strong colours against the stillness of the landscape. The unusual composition of this vertical work (above) - resembling a Chinese hanging scroll, rather than the typical horizontal landscape - draws attention to the Singapore River, which occupies three-quarters of the painting. The stretch of the picture plane conveys the river's depth. This view of the river (above), with the Supreme Court visible in the distance, was painted from the vantage point of Pulau Saigon, an island between the banks of Robertson Quay that no longer exists. The year after this was painted, the island became an extension of the mainland when the western arm of the river was drained. It later merged with Magazine Road in 1991. The high-rise buildings that dwarf the surrounding shophouses hint at the changes to come. Lim gifted this work to the doctor who treated him during his final illness.